Internationally qualified and experts in their field, our Meth Lab Remediation technicians provide a complete Meth Residue Clean Up service across the South East Queensland and Northern New South Wales regions including New England and Northern Rivers locations. Our Remediation technicians follow a stringent process to ensure the property decontaminated. The dangers that remain after meth labs and their cooks are out of work don’t dissipate over time. Meth residue remediation isn’t just a process of decontamination of the location where meth was produced or smoked. The entire meth house or property may have been filled with toxins, from the carpet to the furniture, drywall, HVAC system. The toxic chemicals that are emitted when producing or smoking meth can be absorbed through ingestion, skin absorption and can even inhalation. The dangers of meth residue or drug manufacturing aren’t only confined to the walls of the property. Many times waste is dumped outside the location, chemicals are burned in order to quickly dispose of evidence, dumped down the drain and in locations that have well or septic systems the filtration systems can be completely contaminated, as well as the soil. 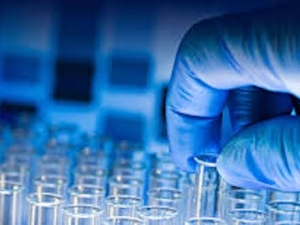 Although each Meth Lab Decontamination job has its own unique set of difficulties, almost all will be divided into primary and secondary contamination areas. If you or a loved one is faced with the daunting and overwhelming situation of meth lab decontamination, don’t hesitate to contact BioHaz. Our team of Meth Lab Decontamination technicians are on standby, ready to talk you through our comprehensive service to assist in the clean up and remediation of a property or area affected by a Methamphetamine Contamination. Any meth lab decontamination job has its own unique set of difficulties and problematic areas BioHaz provides prompt and efficient Meth Lab Decontamination and Remediation technicians servicing all residential and commercial property owners in all locations in New England and Northern Rivers locations including Alstonville, Yamba, Ballina, Maclean, Byron Bay, Tweed South and Lismore. BioHaz is ready to provide you with assessment, testing and decontamination as part of our complete Meth Lab Clean Up process. The first step is an onsite survey and inspection. Once any materials and equipment used in the manufacturing of meth or the drug lab equipment as been removed, an onsite survey and inspection is completed to gain a preliminary assessment of the property where the goal is to provide information to assist with the development of the RAP. Any information gathered in the first step of the remediation process is documented in a written summary. Secondly, meth residue testing is required. The need for meth residue testing in the meth lab remediation process is solely dependent on the circumstances of each property. 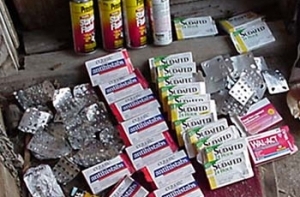 Drug residue testing can significantly reduce costs associated in the remediation process by singling out contaminated areas only and the automatic discarding of any furnishings or materials too contaminated to be cleaned. 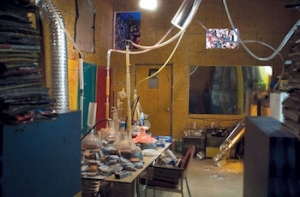 The Remediation Process of a meth lab is a specialised service. BioHaz follows a stringent process to ensure the property is remediated to a hazard and habitable zone. A remediation action plan is drafted based on the pre forensic testing results and determines how the affected areas will be remediated to a safe and hazard-free condition. The remediation action needed for each property is determined on a case-by-case basis. Once the remediation is completed, the post-forensic testing occurs, which is a crucial step of the decontamination process. The property will be re-tested and samples sent to an independent lab for analysis. 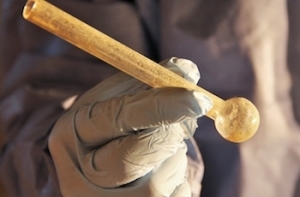 The post forensic test determines whether the property has been cleared to a safe state, and to comply with the Australia standards, the final finding must be less than 0.5µg/100cm2. When a person enters a meth lab before it has been properly cleaned and decontaminated, contamination becomes a real and serious health risk. Immediate exposure to a meth lab is serious. Toxicity levels and the sudden release of gasses can lead to long term health issues and potential disability due to the associated respiratory effects of corrosive and poisonous gasses. Further short and long-term health risks associated with meth labs can include eye irritation, respiratory issues, insomnia, skin irritation, nausea, vomiting, headaches and chest tightness. At BioHaz we offer a comprehensive service to assisting in the clean up and remediation of a property or area affected by a Meth lab. Our expert Meth Lab Decontamination technicians are ready to provide you with assessment, meth lab testing and decontamination as part of our complete drug lab remediation process. 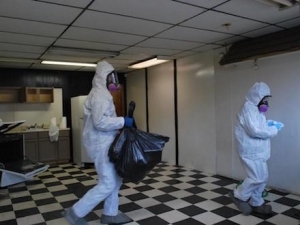 BioHaz technicians are here to help our clients recover from any situation leading to the need for Meth Lab Decontamination and Remediation services. Our friendly and knowledgeable team are available to assist.